A wonderful email popped into my in basket awhile ago that impressed me. It was from Andrea Myers to the members of the women's small group that she was leading at that time. She was getting ready to restart the group following the summer break. With her permission, I want to share it with you as a great example of how all of us can help our groups ramp up to be ready to move into the next study. We will be starting our ladies bible study this Thursday, September 19 from 7:00 p.m. to 8:30 p.m. at my house. If you have not already purchased the book, you can purchase it online using the link below. 2 Peter is a very short book. If you can, please read through all of 2 Peter (there are only 3 chapters) before we meet on Thursday. Study 1 is entitled "The Finish Line (overview)". Thanks, Andrea, and a tip of the hat to all of you who are going the extra mile to help your group members better understand the background of the Scripture that you are studying. Contextual information is one way to make the Bible resonate with readers who are less familiar with God's Word. All good study Bibles have this kind of material in them at the beginning of each book. If you don't have a study Bible, you may purchase a copy of the one we are selling at the MAP for $25. How about your group? Have you tried any ideas to help your gang have success with your study? Maybe you supplemented the study guide with additional resources. Perhaps you used a video to enhance key aspects of the material you were reading. Or maybe a music video helped bring a worship component into your group time. What creative ideas have you tried out that you can share with us and the other group leaders who are reading this? Let us know by dropping an email to grouplife@mclanechurch.org. During high school, my youth group would go every fall to a camp that sat high on a dune above Lake Michigan. By October the air was crisp and full of the scent of burning leaves, the lake choppy and layered in shades of blue and gray—all heralding the change of seasons. The weekend held the promise of all-night girl gab sessions, midnight hikes up the dunes, and intense small-group discussions. I couldn't get my sleeping bag in the van fast enough. A "narrow" gospel? What the heck does that mean? The gospel preached in our congregations and small groups makes a huge difference in the kind of people our members become. Specifically, congregants' understanding of the gospel affects their views of three arenas crucial to living as the tsaddiqim (God's righteous ones): sanctification, evangelism, and mission. This is why it is crucial that missional leaders preach the "big" gospel of the kingdom-the gospel centered on Jesus' announcements that the long-awaited kingdom had broken into human history. This big gospel combats the too-narrow gospel so many of us hold. For months, as I drove back and forth between my house and my church, I noticed an elderly woman collecting tin cans from curbside recycling bins. She wore simple slacks and an overcoat. Walking along the side of the road, she stooped at each blue recycling bucket to fish out cans and drop them into her own white garbage bag. Was she a sculptor of tin? Did she collect those little metal tabs? Did her new cardio workout require intermittent squats? I had no idea. One day while taking a walk, finally liberated from my minivan, I was able to chat with this woman. I learned that Miss Sarah was unable to make ends meet while living on a fixed income. She was gathering aluminum cans to be recycled for change in order to supplement what she received each month. It was a scenario I had not imagined. Although I saw her on a regular basis, I had no idea what life was like for my neighbor until I stood next to her and heard her story. For too long, my neighbor was a stranger. The goal of a small-group leader is for the people in your small group to see it as "our group." Good leaders proactively help make this happen. God has gifted people in your group, so when you give them a way to use their gifts you not only share ownership, but also give them a way to serve in their sweet spot. That makes it a win for you as the leader and fruitful and fulfilling for the group members as they discover and use their spiritual gifts. The topic of our first message in the "Teachings that Got Him Killed" series is forgiveness. You may want to expand on the small group curriculum with some of the material in this article by Keri Wyatt Kent from Smallgroups.com. Jesus often told people, "Your sins are forgiven." What a stunning statement. Forgiveness is powerful. Unforgiveness can also be powerful: when we refuse to forgive those who have wronged us, we ironically and powerfully hurt ourselves. Lewis Smedes once said, "Forgiving is the only way to be fair to yourself. Would it be fair to you that the person who hurt you once goes on hurting you the rest of your life? When you refuse to forgive, you are giving the person who walloped you once the privilege of hurting you all over again—in your memory." Beyond the healing that forgiving someone who wronged us brings to our hearts, it is also commanded in Scripture. Growing up...it's an exciting process...and a bit scary too. We enjoy the safety of living in a place where we know what to expect and have everything pretty much under control. But God's plan holds so much more in store for us...if we will but challenge ourselves to tackle and overcome the next hurdle that lies in our path. We need to capture a vision for growth that enables us to live up to what God wants us to achieve. Starting a regular quiet time of prayer. Get involved in a ministry service opportunity through the Service Outlet. Begin a time of journalling about life and faith. Read a new book of the Bible and seek how God would apply it to your/their life. Become a mentor for someone new in their faith journey. In other words, as Emeril Lagasse might say, we need to be encouraging ourselves and our group members to "kick it up a notch". Here is a process for helping people deploy their spiritual gifts in your small group. It will help the group function more effectively and allow each member to grow and mature in their area of giftedness. Cast a vision for mutual ministry. Together you should read and study Ephesians 4:11-13, Romans 12 :6-8, and 1 Corinthians 12:8-10, 28. Help your group understand the value of serving together and serving one another. Help members identify their gifts. Spiritual gift assessment tools like Network and S.H.A.P.E. will help people identify their gifts. Go through this material as a group or encourage individuals to take advantage of these programs as they are offered by the church. Discuss giftedness with each other. Ask group members to explain their gifts to the group and how they might use them to encourage other members of the group. Serve in areas of giftedness. Allow people to serve according to areas of giftedness and passion within your small group. Check out the Service Outlet for McLane Church. The online access to this ministry area allows you to sort service opportunities by spiritual gifts as well as in other ways, such as ministry area, days & times needed, etc. Consider ministry opportunities. Discuss ministry opportunities within the group that will utilize people's giftedness. NOTE: A quantity of this book area available for group leaders to take and use. Stop by the GroupLife Center for your copy. Looking for God. Can you hear him now? The New Year is here...and perhaps you've resolved to do a better job of staying in touch with God in 2011. What a great idea! It's wonderful to re-set our lives from time to time...making those mid-course corrections and tweaking what is a bit askew. If you have 10 minutes, check out the Rob Bell video below. It may help you be a bit more successful with your resolution. As a small group leader, one of your primary responsibilities is to help your group members in their spiritual journey with Christ. As we enter 2011, take some time to find out how they are doing with their daily devotions...talk to them about practical ways to get into their Bible so that the Lord is able to speak into their lives. Perhaps a good way to start is to talk about what Bible that each person is using. Is it a Bible that they are comfortable with and can understand easily? Does it have good study aids (maps, character profiles, timelines, etc.)? Let each person in the group share what their Bible means to them...how they read it, how often they read it, and so forth. You may want to offer them some suggestions on translations or paraphrased Bibles that will help them more easily get into reading it on a regular basis. 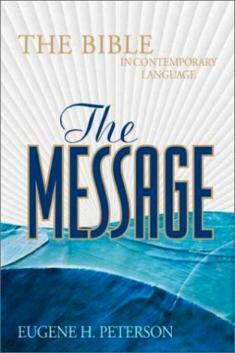 One (of many) Bibles that you could recommend is The Message Bible, pictured here. Many people find the contemporary language of this version to be very easily understood. We are working on creating a Bible display section in the GroupLife Center that will allow people to look at a variety of Bibles to see what might work best for them. Another helpful component of a daily quiet time is the use of some type of devotional aid. Ask your group members what devotional they use, if any. There are a great variety of devotionals available...and they are all designed in one way or another to help a person think upon their relationship with God...as well as to find ways to bring their faith to life through Christ-centered action. McLane Church offers two devotionals to our people. The first is Our Daily Bread, published by Radio Bible Class. This is a decent starter devotional for people who are relatively early in their spiritual journey. The other is a customized devotional that is written for each of the McLane sermon series. This publication is specifically designed to take the message of the week and help bring application of the Scripture into the life of the reader. Both of these devotionals are available at the ministry services center in the front of the church. We hope that you enjoy the challenge of taking your group members to the next level in this way. Everyone is at a different place...and part of your leadership role is to help each of them move on from where they are and to find out what God has in store for them next. What better time to do this than at the start of a new year? If you have any questions, or wish to have some additional help with this, you can touch base with your coach, and of course you can always stop by the GroupLife Center or drop us an email with your thoughts. Jon and Colin play vigorous racquetball every Wednesday and Friday at lunch. Every few weekends, they take time to talk and relax together. They have learned that their relationship doesn't grow without spending time simply enjoying each other's company. They have found a balance point between being friends for the purpose of playing racquetball together and being friends who simply have affection for each other. Because we are partners with God in ministry, it is completely right and good for Christian leaders to engage in spiritual disciplines that have a purpose beyond ourselves. This includes praying for the people with whom we minister and studying the Bible to prepare for preaching or teaching. Yet these practices have a component of instrumentality. They are not focused on simply enjoying the presence of God and growing closer in intimate friendship with Jesus Christ. As humans, we need God in many ways in our lives; therefore, much of our relationship with God will always have aspects of instrumentality. The people of Israel and the followers of Jesus throughout the ages also spent time in God's presence simply to enjoy the wonder of God's goodness. "How lovely is your dwelling place, O Lord Almighty" says the Psalmist. "My heart and my flesh cry out for the living God" (Psalm 84:1, 2, NIV). Jesus encouraged his disciples to abide in him and also to enjoy friendship with him (John 15). Countless other Scriptures testify to how precious it is to draw near to God. In order to maintain spiritual health, every person in ministry needs to engage in a few spiritual disciplines that nurture relationship with God as an end in itself. In conversations with other pastors and congregational leaders, I've identified several reasons why this is true. First, we need to remember that the whole of our life matters to God, not just our ministry. We so easily get caught up in what we are doing, and our identity shifts away from being a child of God to being a pastor, staff member, or other kind of minister. When we engage in spiritual disciplines that have no obvious function related to our ministry, we nurture our identity as God's beloved children. The first Sunday she attended the worship service without a role in leading music, she found herself criticizing several aspects of the music. God spoke to her clearly that morning, saying, "If you can't worship me for who I am, we have a problem." As the weeks passed, she came to understand that her absorption in playing music had blinded her to other aspects of worship, particularly intercessory prayer. During and after the guitar fast, she has engaged in intercessory prayer in new and fruitful ways. This new pattern of prayer reminded her that God cares about her whole self, not just her musical side. While God called Anna to fast from something related to her ministry, God can also call us to fast in a way that simply helps us clear away the clutter and draw near. Fasting helps us realize our dependence on God for everything in life. It nurtures thankfulness, and often confronts us with our addiction to comfort. While God may call us to fast and pray for ministry needs, fasting can also be an excellent spiritual discipline to help us rest in God and rejoice that God loves us and cares for us, quite apart from what we do. We need to nurture an inner life that is not related to our ministry so we can move on to other jobs or into retirement and still have a sense of self apart from our ministry. Anna could lose her voice and get crippling arthritis in her hands, and she would still be able to pray. That statement would have been true for her in a theoretical way before her guitar fast, but now she knows it is true in a deep and powerful way. We need to hear God's voice about our lives beyond our ministry. The spiritual discipline of discernment is deeply significant for those in Christian leadership. We need to grow in our ability to hear God's guidance for directions for ministry, particularly in these rapidly changing times. But the discipline of discernment is also significant for areas of our lives beyond our ministry. Are there new ways I could show love to the people in my life? Is God calling me to care for my body or the environment differently than I am now? How is God calling me to use my time when I'm not working? In what ways is God calling me to grow in prayer? We need to nurture a devotional life that is not related to our ministry so that we can be spiritual partners with our spouses, other family members, and friends. The people in our lives who are not involved in professional ministry roles are engaged in various forms of service and ministry in the world. They rely on God for love, strength, and guidance for all the areas of their lives. If our devotional lives are centered around our work, we run the risk of making it seem like our lives are in a different category from other people's. This damages our relationships with those we love, and it also damages our perception of ourselves. All of us, first and foremost, are human beings created in God's image, redeemed by Jesus Christ to be God's beloved adopted children. Spiritual disciplines that help us draw near to God in pure affection enable us to remember our humanity and our solidarity with others in every walk of life. The spiritual discipline of confession can be helpful here. When I am honest about how short I fall from God's desires for me, and when I receive God's forgiveness, I am restored to a position of beloved child. I am no different than any other person who needs and receives forgiveness. In that position, I can be a spiritual partner with those people in my life whose jobs don't revolve around Christian ministry, like mine does. We need to retain our enthusiasm for the things of God in order to be effective ministers. And we need to model a lively Christian faith. These are good reasons to develop spiritual disciplines that are separate from our ministry responsibilities. Yet these reasons are in themselves instrumental because they help us meet a ministry goal rather than nurturing a relationship with God as an end in itself. And that is one of the perils of Christian ministry. This wonderful thing we are called to—an intimate relationship with God from which ministry grows and flows—is itself a part of what we are called to model for others. This can be a recipe for hubris and self-importance. And the pull of pride is yet one more reason to develop and practice spiritual disciplines that have no connection with our ministry. These disciplines and practices can help us learn to live as beloved children of God—in the midst of our calling to lead and serve others in their journey of growing into Christ's likeness. I can picture saints from ages past reading this article, and I imagine they would say that all the reasons I've given here are instrumental, and that God invites us to draw near simply because God is so good. Full stop. No other reason. And they would be absolutely right. "Lord, you have been our dwelling place throughout all generations" (Psalm 90:1). "How great is the love that God has lavished on us, that we should be called children of God" (1 John 3:1). By: Lynne M. Baab (www.lynnebaab.com), a Presbyterian minister and the author of Fasting: Spiritual Freedom Beyond our Appetites and Sabbath Keeping. Note: This article has been excerpted from the SmallGroups.com training tool called Finding Focus Through Spiritual Disciplines. What spiritual disciplines do I practice on a regular basis? Of those disciplines, which are directly related to my main area of ministry? What are some disciplines I could practice that are separated from my main area of ministry? What do I need to do to begin practicing them?